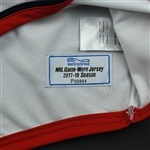 This white jersey was worn by Brady Austin while playing for the Columbus Blue Jackets during the 2017-18 National Hockey League preseason. It includes the NHL Centennial patch. This jersey has an unrepaired hole on the left sleeve.